This is a copy of a posting to my blog. On a recent walk on Baildon Moor I sat quietly on the edge of the 11th fairway of the golf course and was rewarded by several Skylark coming and feeding on the fairway quite close to me. The Skylark is an RSPB Red Status bird. Its population has declined significantly. The Moors are a great place to exercise dogs but, between March and July, I for one would prefer it to be done in places like the two fields either end of Roberts Park. During the nesting season dogs should be on leads when on the Moors. 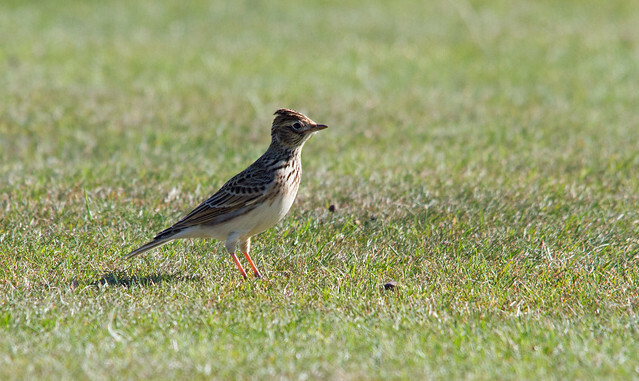 The Skylark breeds on Baildon Moor and likes to nest in clumps of grass on the edge of the fairways. One of the enjoyable things about Summer is hearing Skylarks trilling away in the sky and then finally spotting a tiny dot hovering high above you. Pheasant, Red Grouse, Curlew, Snipe, Lapwing, Pied Wagtail, Meadow Pipit, Willow Warbler and Reed Bunting also nest in or around Baildon Moor. Any of those links will take you to photos of the bird in my flickr photostream. 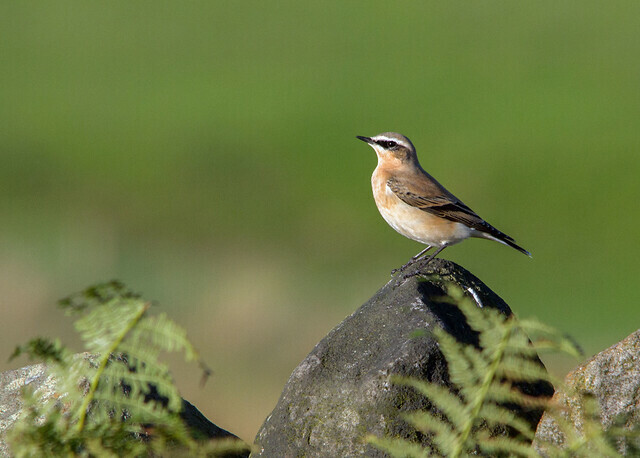 I also saw several Wheatears. They will be passing through on their way to Africa, feeding up on the plentiful supply of insects. They would stand on the short grass motionless and then run fast for 20 meters or so, then stand still again, occasionally jumping into the air to catch something or pulling something out of the short grass. They also like to stand atop the stone walls looking down into the grass and jump down into it to feed. You may have noticed the stone walls being rebuilt around the Moors. Quite a few were collapsing in places and the rebuilding is being done as part of the Higher Level Stewardship agreement. 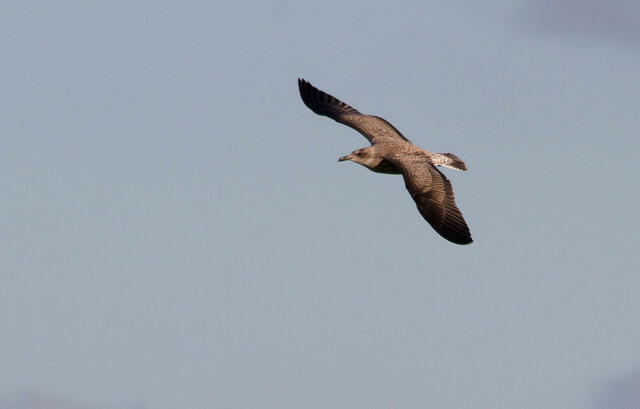 Quite a few Crows and sea birds were around but this one is larger than most. It is a juvenile and I am hoping that iSpot will give me a proper ID. Nick Tonge may also give me an ID if/when he sees this.